The Manchester Picadilly Travelodge is, no exaggeration, literally in the centre of town. We were less than about 200 metres from the Northern Quarter, and under a five minute walk from the Arndale Centre. The entirety of Manchester city centre shops and restaurants could be walked to within 15 minutes. It more than makes up for the lack of parking, especially as the train station is under a mile away! We were given a double room which overlooked the city. If you’ve ever been to a Travel Lodge, you’ll know the interiors are nothing special but the room was spacious, clean, and everything seemed new and untouched. There was a wall mounted TV which had a USB port for films and TV shows you have downloaded, a desk and chair, a small bathroom with a shower, and a discreet rail for hanging up your clothes. The bed was very firm, and the pillows; I can only sleep on pancake pillows so actually ended up sleeping on a jumper as they were too big for me! The headboard had two cubby holes for your phone and a glass of water, although only my side had a plug for charging. The lodge itself was modern, clean and simple. You can tell it’s not a 5* hotel but for a weekend away, or even a week, I don’t think you can go wrong. The first floor had the reception and the café, with a bar which served certain foods 24/7 – perfect for your greasy pizza at 3am. We arrived on the Friday around 7pm, and after checking in headed out for food. There are a lot of chain restaurants in Manchester (Travel Lodge is next door to a Bella Italia and Nandos) but we wanted to go to somewhere we’d never been. After wandering around, we stopped by Gusto’s; a fancy Italian style restaurant which, despite looking expensive and glam, is pretty affordable. We were starving so opted to share a board of meats and cheese, served with a chutney and focaccia bread. The cheese we picked (teppigio and smoked pravola) was absolutely gorgeous; mellow but with a punch of smokey goodness. The teppigio was also delicious, semi-soft with a bluey crust. The parma ham was delicately flavoured, and the chutney a perfectly sweet accompaniament. For £7, it could have been bigger but then I guess if you wanted something more filling as a starter, you’d go for an actual starter! We both struggled choosing a main as the menu was extensive. Every dish had a good combination of fresh herbs, spices and quality ingredients and honestly, we were starving and practically salivating. Scott opted for pizza and I went for the lemon and chilli pasta with crab meat. It was amazing; a small kick from the chilli which paired beautifully with the lemon. The pasta wasn’t too oily, and the crab meat just added something extra without overpowering the flavours. I stole a bit of Scott’s crust and it was one of the best crusts I’ve had. Crispy, light and doughy all at the same time. His pizza was huge too, although obviously he managed it all! After eating, we explored the city a little bit. I kept remembering places I’d been to when I was younger, but in this vague sense of, “I’ve been here before”, rather than actual memories! We stopped by Missoula for a few drinks; they did teapots of cocktails so we got a Long Island Iced Tea-Pot to share, and then both had a cocktail before heading home. On Saturday, we visited the Travel Lodge dining area for breakfast. It was self-serve, but the food actually was fresh and topped up regularly, rather than slopped in a pile to wilt away. Hot food included sausages, bacon, scrambled egg, beans and tomatoes. Continental included croissants, blueberry muffins, toast, jam, honey and Nutella, and then there was cereal, fruit and yoghurts available (as well as tea, coffee, juice and water). I had some eggs, beans, tomatoes and toast with a small bowl of granola, yoghurt and fruit. Scott had a “three course breakfast” of full English, cereal with yoghurt, and a blueberry muffin. He did the same Sunday, too. Most of Saturday was spent shopping. Like, serious shopping. The first stop was Afflecks Palace. If you’ve never been, it’s like a huge alternative indoor market, selling everything from beads and emo badges to Pokemon figures and piercings. I used to go back in my emo teen days and was so happy to see it hadn’t changed! After checking it out, we wandered around the Northern Quarter and explored some kooky little shops, then looped around to the Arndale Centre where we bought some bits for Scott and the house. By this point, we had been walking around for a few hours so we stopped by for some food at a place called Wahu. Wahu is a cool little restaurant that offers healthy food; each dish has protein, complex carbs and veg, with lots of Asian inspired dishes but also wraps and salads. I opted for a beef teriyaki rice dish, and Scott a sweet chilli chicken rice dish. Both were ah-mazing. The meat was cooked perfectly, the rice soft (and it was brown rice which is hard to get perfect!). The sauce on both dishes were amazing, especially the teriyaki! My broccoli was a tiny bit undercooked, and the portions weren’t huge for only £5.95, 100% no complaints. It’s just simple, good food; and there are smoothies, juices and more to choose from as a drink! After stopping for food, had a look inside House of Fraser, got distracted by the huge sale that was going on and bought a lot of house stuff. Then we headed back to the hotel and dropped off all of our bags, and went back into the Northern Quarter to a little material shop. We’re reupholstering our dining room chairs as they’re old and gross so picked up some grey fabric to do so! Then it was time for showers and getting ready to go back to the Northern Quarter where I met my longstanding best friend from when I was about 4 years old. We headed to Blues for drinks (£5 for a single Vodka coke!!!) for a few hours, and caught up on each others lives. I decided to dress pretty casual because me and Scott had a meal booked later and I didn’t want to be all bloated and gross. I was sent these black wedges* by Daniel Footwear and they’ve fast become my favourite going out shoes as they’re beautiful, but also mega comfy and can be smartened up or casual’d down. Ultimate fave. After drinks, we headed down to Chaophraya and had a beautiful Thai dinner. The restaurant was dimly lit (for the ambience I guess) so I couldn’t take pictures, but trust me when I say if you like Thai, you’ll love Chaophraya. We had tempura prawns to share, then grilled seabass with coconut rice and chicken pad Thai to share. We were going to have some more drinks but we were so full, we could barely make the 10 minute walk back to the hotel! This weekend really reminded me how nice England can be, and has definitely inspired me to visit more cities in the UK. 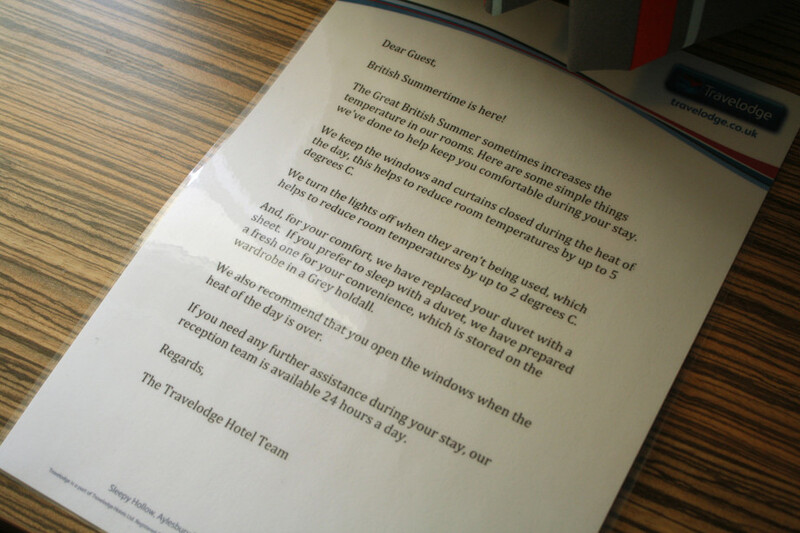 And yes, I probably will use Travelodge for when I go!